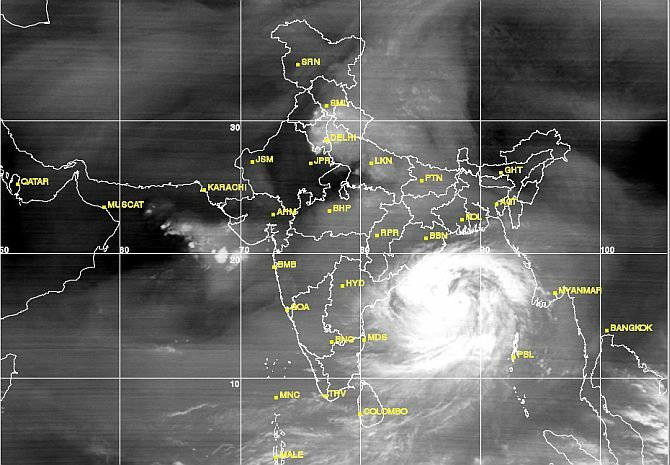 Cyclone Phailin has made landfall in Gopalpur in Odisha, the Indian Meteorological Department has confirmed. The east coast will witness heavy rainfall in the next 48 hours, said the IMD, adding that Phailin will remain in a cyclonic phase for the next six hours. The next one hour will be the most intense period of the cyclone, which is being considered as the worst one to hit India in the last 14 years. The cyclone is currently moving at a speed of 200 kmph, said the IMD, adding that Cyclone Phailin cannot be termed as a 'super storm'. Authorities have evacuated more than 5.25 lakh people from the coastal areas of Odisha and Andhra Pradesh. "Our main focus is to avoid loss of human life. So far, we have evacuated 4.25 lakh people in Odisha and 1 lakh more in Andhra Pradesh," said Union Home Secretary Anil Goswami. Over 2,300 NDRF personnel have been deployed for search and rescue. Twenty medical teams have been flown in with medical support and 60 teams of the navy were ready at different places. Coast districts of West Bengal, East Midnapore and South 24 Parangas are put on high alert as the cyclone inched closer. There is heavy rain already in the coastal areas of Odisha and Andhra Pradesh and several districts also witnessed power cuts. With a wind speed of 210-220 kmph, the tides could rise up to 3.5 meters and seawater could enter 300-600 meters in land, the IMD said. "Even after its landfall, the cyclone impact is likely to stay for six to eight hours after which, it will turn into a cyclone and then into deep depression," said the IMD. Under impact of Phailin, the entire coastal region was lashed by heavy rains on Saturday besides squally wind of above 70 kmph. Uprooting of electric poles and tree branches have been reported in various places. "The system would move northwestwards and cross north Andhra Pradesh and Odisha coasts between Kalingapatnam and Paradip close to Gopalpur (Odisha) by the evening as a very severe cyclonic storm with a maximum sustained wind speed of 210-220 kmph," the latest IMD bulletin said. The districts likely to experience tidal surge are Ganjam, Puri, Khurda, Jagatsinghpur and Kendrapara. The administration of Balasore and Bhadrak have also been put on alert, Special Relief Commissioner, Odisha, P K Mohapatra said. In Andhra Pradesh, as many as 52,000 locals were on Saturday evacuated and 25,000 people accommodated in cyclone shelters in Srikakulam. On Friday, 64,000 people in the north coastal districts of Srikakulam, Vizianagaram, Visakhapatnam in Andhra Pradesh were evacuated to safer places. Vizianagaram Collector Kantilal Dande said 10,000 to 15,000 people living in vulnerable areas are being evacuated and they are monitoring the situation on a minute-to-minute basis. The East Godavari district administration has started shifting fishermen from Uppada-Kakinada area to safer places in view of the cyclone. Irrigation officials are monitoring levels in water bodies in the coastal district, where medical teams have been kept ready, they said, adding, "We are expecting the intensity of cyclone to be more in the night." Andhra Pradesh Chief Minister N Kiran Kumar Reddy directed the chief secretary to monitor the preparedness for the cyclone with district collectors and officials of defence forces and the NDRF. Reddy inquired about the cyclone situation on Saturday morning and directed the officials to be on high alert and ready to deal with any eventuality, official sources said. State Revenue Minister N Raghuveera Reddy reached Visakhapatnam this morning and would proceed to Srikakulam district, bordering Odisha, which is expected to be among the worst-hit. Talking to reporters in Visakhapatnam, the minister said all departments concerned have been put on alert. Fishermen, who went for fishing, were being brought back. Medical Education Minister K Murali Mohan and senior officials are closely monitoring the situation in Srikakulam district, the sources said. Fishermen have been advised not to venture into the sea for the next 72 hours. Special control rooms have been set up in Kakinada, Ramachandrapuram and Amalapuram towns to monitor the situation. Thirteen special officers have been deputed to assess the situation on the Andhra Pradesh coastline and 63 relief camps have been opened in the district. Naval and Coast Guard services have been kept on standby in case of emergency. 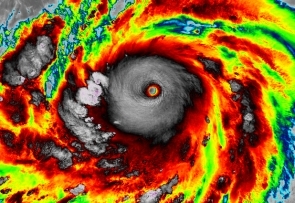 The US Navy's Joint Typhoon Warning Center in Pearl Harbour, Hawaii, has said Phailin is expected to break the Indian Ocean intensity record set by the 1999 cyclone. Nearly 10,000 people were killed in the super cyclone of 1999 in Odisha. Troops of Bison division of the Indian Army moved to Srikakulam and Visakhapatnam districts late on Friday night to assist the respective district administrations in relief and rescue operations. "Four teams consisting approximately 500 army men moved to coastal district with relief material and medical arrangements," a defence release said in Visakhapatnam. The columns are equipped with mechanical powerboats, life jackets and life saving medicine, it added.